i had my "interview" (that's in quotes because the meeting wasn't with someone who didn't know me, my work ethic or qualifications and background already) on friday. as soon as we sat down to lunch, he was quick to let me know that as soon as we'd hung up the phone a couple of days prior, he'd picked up a phone call from another potential candidate - one who was just as qualified as i was. my heart sank, but i kept the happy face on and continued with the discussion about the actual job. 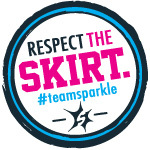 i left feeling pretty torn - i couldn't decide whether or not to be positive about it and hope that my personality and experience wouldn't fail me, or to just tell myself that i hadn't gotten it, so that i wouldn't be disappointed if/when that news came through. by nature, i am an optimist - but i had a sinking feeling about this one. 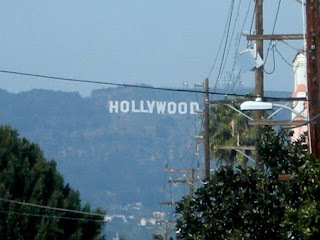 so i chose to consider the job out of my reach and went on my merry way. oh, well. i'm just going to keep plugging away at my current set-up - which, after all, isn't so bad. i only work 4 hours a day, probably only do actual work for 30 minutes of that time, and the pay is decent. but as my fingers itch to type out a letter of resignation, i'm resolving to keep my eyes open and start looking around for other employment possibilities. 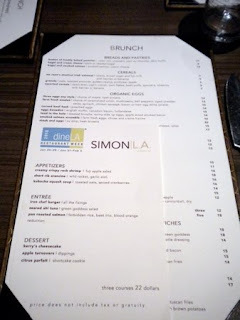 now, on to more fun stuff: a recap of the rest of my dine l.a. experience! 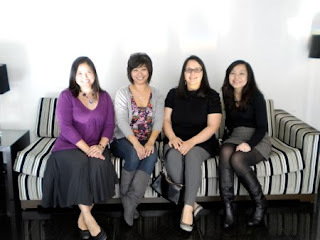 reservation #2 was for brunch with more SFAMily members - the monkey, winnie, and nanette. the teen joined us too, even though it meant hanging out with a bunch of old chicks. heh. 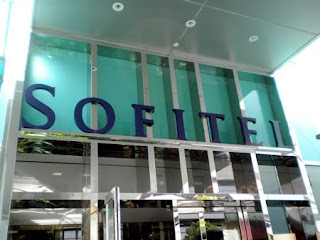 we pulled up to the sofitel, enjoying the sunday-light traffic on the freeways. 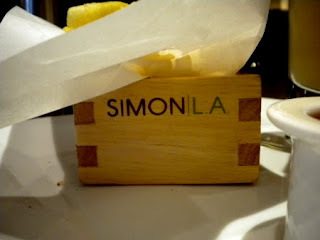 i'd not yet been to simonla, but i knew a few others had and enjoyed it. so i was pretty excited when our little group settled on it for our GTG. 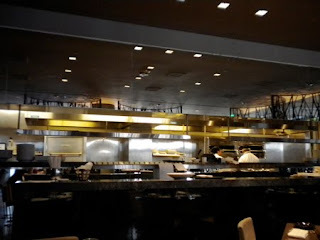 we were led to a table in the middle of the restaurant and in front of the kitchen, where nanette was already seated. 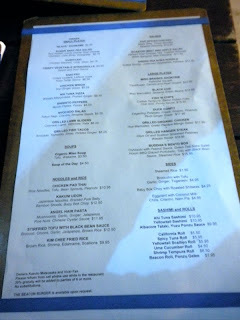 as usual, i'd already checked out the menu online (which was also helpful for the teen), but i scanned it anyway. 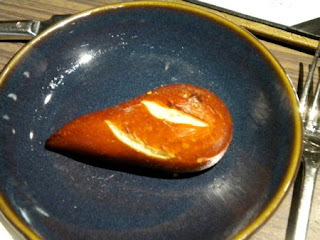 i dug into the pretzel bread (so good) and then the first course arrived. 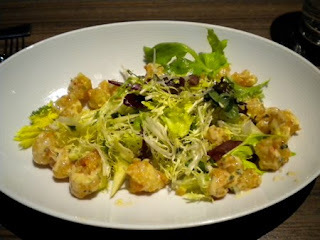 i'd opted for the creamy crispy rock shrimp, and i plowed through the deliciousness in no time. winnie had chosen the short rib arancine, which i'd puzzled over and didn't really understand until it was served. i'm a food lover, but i don't know a lot of the more fancy-schmancy cooking terms and was surprised to see how simple it was. 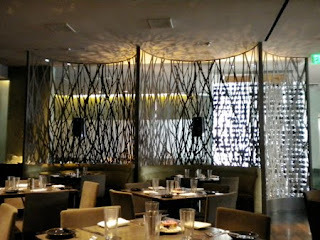 i don't have a picture, but the short rib was shredded and then formed into little balls covered in a light, crunchy batter. 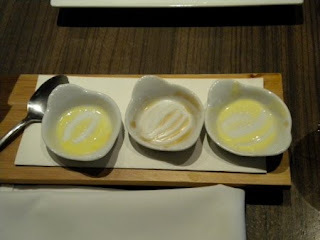 we all got to sample a bit, and as we "mmmm"'d and "aaaaah"d, the monkey proclaimed them to be "golden balls of yes." the teen lost it and ended up laughing so long and hard over it and ended up wiping tears of merriment away as we all grinned at her. 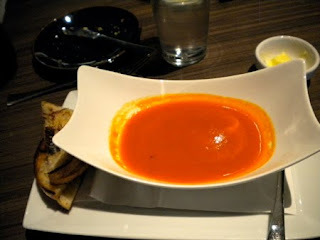 here's her simple roasted tomato soup with grilled cheese sandwich. 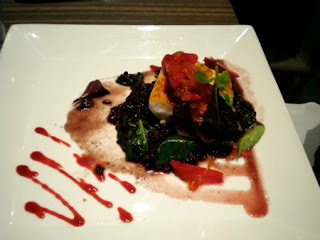 nanette and i both found ourselves wavering between the pan-roasted salmon served with "forbidden rice" (you know that alone piqued my curiosity) and the ahi tuna. so we did the logical thing - ordered both and split them. all-around win! the monkey went with the iron chef burger, and we were all captivated with the adorable presentation when it was set in front of her. 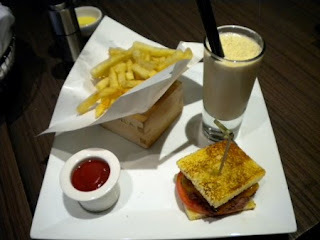 look - fries in a cool little box and a mini-milkshake! 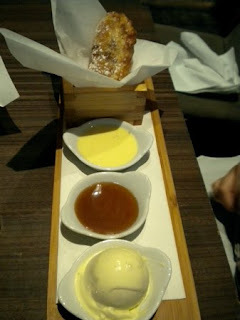 dessert was the final course, and i'd gone with the cheesecake, while nanette and winnie chose the apple turnovers with dipping sauces and the monkey had the citrus parfait. 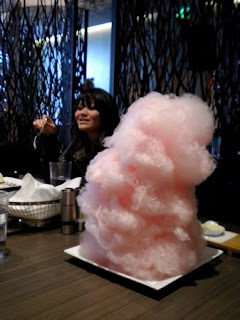 all were pretty good, but none of them got the reaction that this giant plate of freshly-spun cotton candy did when the server set it on the table. 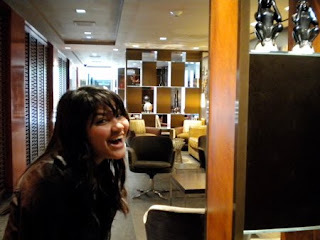 it elicited an awed "oooooooh" from all of us, and she giggled as she walked away. this is one of the many reasons why i love this girl so. nothing is ever too silly to do for a photo. 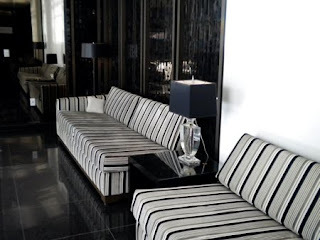 we headed back out towards the lobby and decided to arrange ourselves on one of the couches for a group photo. 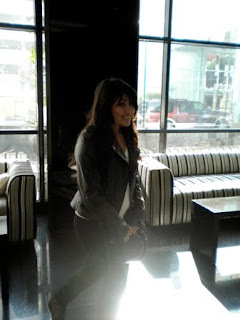 the teen graciously offered to take it for us, so i snapped a shot of her, too. 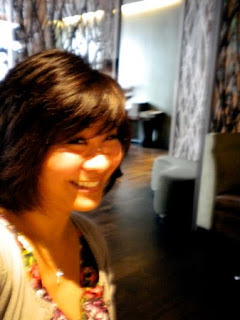 yes, i was trying something different with my hair. and yes, i realize it's not cute. but the rest of us were! 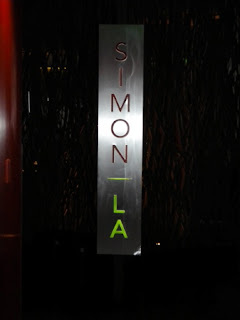 bye-bye, simonla. see you again one day soon. 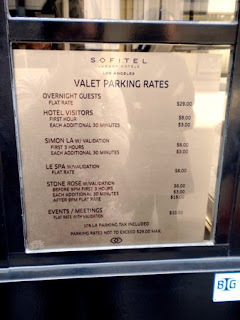 los angeles, the land of exorbitant parking rates. can you tell this picture was taken under protest? 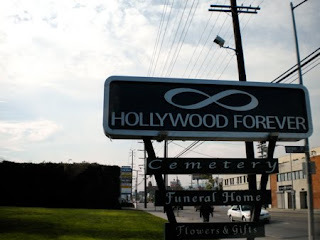 we'd driven past the sign for hollywood forever cemetery a zillion times. i'd told the teen that a bunch of old-time celebs were buried there. and i knew that during summer, you could bring blankets and have a picnic on the lawn while you watch screenings of classic movies. sounds fun, right? 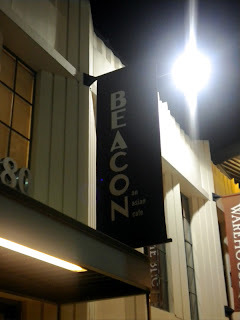 a few nights later, i arrived at my final dine l.a. restaurant - beacon, located in the historic helms bakery district. 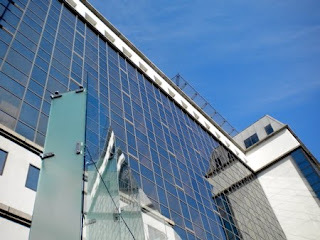 you can read all about the history of this area online, or you can always ask 10yearstogether - she knows all about it. 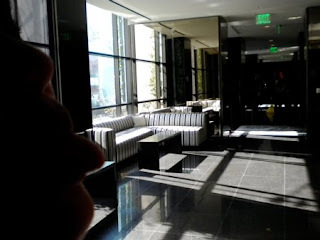 i'd had to fight some major traffic, so i was the last to arrive. i was lucky enough to score a seat at the end of the table next to insomniac, and waved at everyone else as they chattered away. 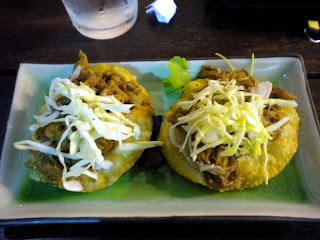 first course: pulled pork tostadas. really good, even though they sounded a little odd at first. 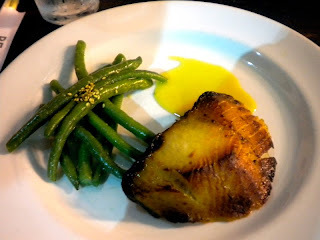 the miso marinated black cod was a big plate of win. just fantastic. 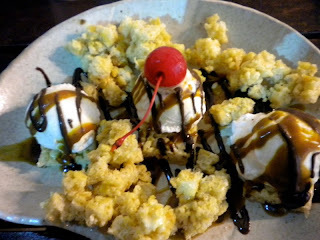 and the menu item that i was most excited about: a rice krispy sundae. mmmm. 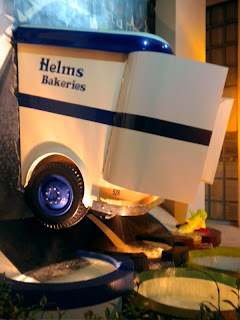 it was delicious, although the rice krispy treats tasted like the kind you buy in a box. oh, well. 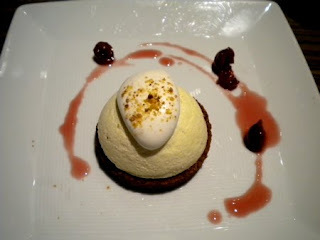 it was still good and i ate every bite (except the cherry, of course). group pic! don't we look happy? well, duh. we'd just eaten. 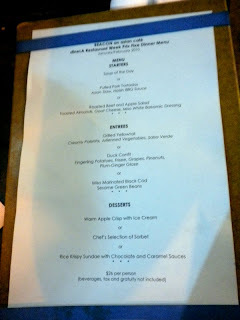 all in all, i was pretty satisfied with my first go-round at the dine l.a. thing. 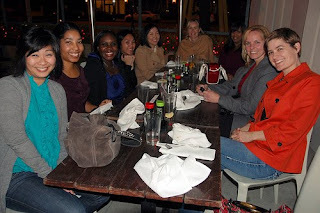 i got to try new restaurants, hang out with friends, and get some great girl time in. 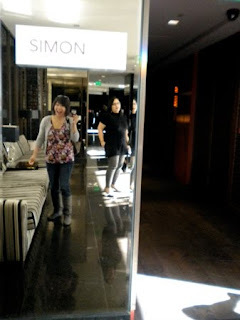 for next time, i've vowed to try some of the swankier places - as the monkey kept telling me, that's where you get the most bang for your buck since their regular prices are generally pretty steep. good thing it only happens twice a year. i've gotta save my pennies for the next round. p.s. 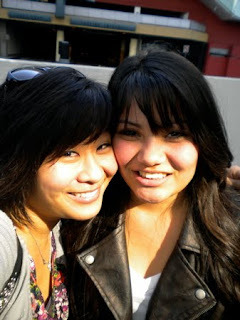 happy birthday to my dear cousin 420! How sad is it that a picture of myself cracked me up? I'm sorry you didn't get it. Don't worry, I am sure you nailed the interview. Maybe the other girl nailed the boss. I mean, oops! Can forbidden rice really be *that* forbidden if it's available for sale at Henry's market? Sorry about the job. :-( Hopefully it just means something better will come along soon. 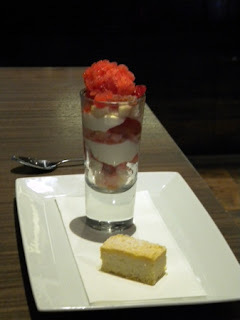 The rice krispie treat dessert looks so yum! I totally agree with the monkey - as usual. I always price out those dining deals to see if they're really a deal. 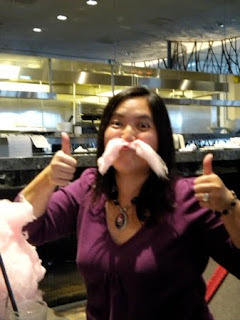 I totally love the new cotton candy trend at high end restaurants. 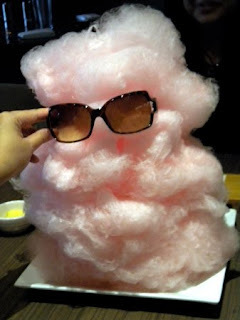 I'm not a fan of cotton candy for eating, but it's just so whimsical to look at! Dying at the picture of WM. 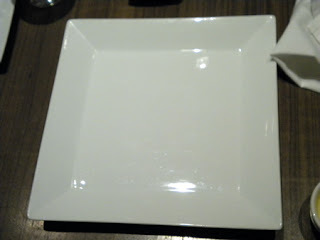 You guys all looked so cute at your brunch. 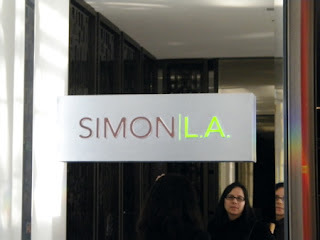 The cotton candy at Simon LA is my favorite thing there. 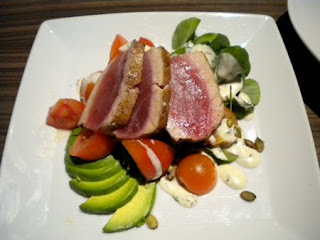 It's just so purtty and tasty! I'm sorry to hear about the job, but I hope something even better comes along soon. I must add that picture of Weezermonkey to my collage. It's always fun to see you (and the teen)!